The story of the truncated 1992 season at Milton Keynes, the last year in which the sport was held in the Buckinghamshire new town. Speedway fan and pilot Mark Meynell recently took a flight over Newcastle and captured these aerial pictures of the Diamonds' Brough Park home. Paul Houghton suggests that speedway would benefit from a series of regional museums and is looking for help in improving the speedway display in the Coventry Transport Museum. 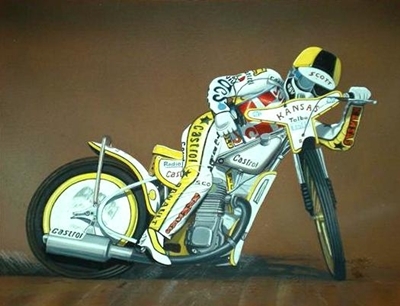 Jim Blanchard has just finished another of his excellent speedway action paintings, this time of Erik Gundersen the three times World Champion. It's not clear yet whether prints of this work will be made available. Jim would urge anybody interested to contact him via his website so that the level of demand can be established. "Many references are made to Wal Morton his name was / is Val Morton. My father was Ken Sharples, one of my sons Paul is mechanic for James Wright who is a grandson of Jim Yacobi and a new signing for Belle Vue this season 2009." "I really agree with comments made about the sport in crisis, supporters are picking their matches to go and watch. I follow sheffield and like many others can't go every week due to price increases on the gate! It might be only a couple of quid, but it's still there, clubs will be playing to empty grounds shortly, bring the prices down and more folk will go to watch. Don't let speedway die!" "You are so right. At the very least, you know there are at least two members of this particular grumpy old farts club! If speedway isn't careful, it will successfully price itself out of any 'family sport' definition. Whether current day promoters like it or not, it's people of our generation (and their families) who they are trying to attract and quite simply it's not going to happen at current day prices. I have two adult kids who together with my wife equate to at least £56 for the new season in basic admission prices, add on 1 programme (between 4) plus at least one round of refreshments and that is at least £60 per week. What family (apart from the Windsors, not noted speedway fans) can afford £240 per month? Break this down, and if your break even figure is 700 spectators per week, this equates to 1400 able to afford going once a fortnight, you're possibly in trouble. Everyone, and I include riders, sponsors, supporters and promoters, needs to get a grip on reality if the sport has any chance of surviving. When you consider how much most incoming revenue (and by that I mean admisson money from spectators) is actually available. " "Many thanks for taking the trouble to download these pictures enabling us all to see what the Museum has to offer. An excellent advert for all the hard work put in by the owners. Very nice to see a section dedicated to Wiggy (Rip fella). Once again well done to all. " Tracy Holmes looks back on the career of a rider who paid the ultimate price for his love of riding motorcycles. Another bumper crop of pictures from Harry Ward's recent visit to the Speedway Museum at Paradise Wildlife Park. Emma selects the greatest ever Ipswich Witches - no surprises then that Louis senior and junior both feature in the team. The Speedway and Grasstrack Show takes place at The Sports Connexion, Ryton on Dunsmore, Coventry on Sunday February 22nd. Admission will be a bargain £2 for adults with children going free. Click the banner below for full details of this great day out. "I agree with Tracy's views on Jerzy Szczakiel. He did not come from nowhere to win the World title and his victory was not too outlandish, even though he is generally accorded the dubious title of "worst rider ever to win the World Championship". Writing in the 1972 Webster's Speedway Mirror annual, Ian MacDonald said in the international section, "The Poles themselves are still Eastern Europe's top speedway country...The international days of Pawel Waloszek and Antoni Woryna seem numbered but there is still an awful lot of talent over there. Leading the way is Jerzy Szczakiel and how the Poles could have left him out of their World Cup team is one of speedway's mysteries!" Szczakiel's photograph is the main featured photograph at the beginning of the section. In the report of the World Pairs, Ian MacDonald also says, "The Polish duo of Jerzy Szczakiel and Andrzej Wyglenda were indisputably masters in the World Pairs Final..." So he was already being touted as the Pole to watch and a possible future champion a year or so before he actually won the title." "What a sad sight. I first went to Rayleigh in 1949, and supported regularly until about 1955, all during my teenage years. Wonderful memories of Jack Unstead, Les McGillivray, Gerald Jackson, Peter Clark, Tom O'Connor etc. Myself and a gang of friends just couldn't wait for Saturday evenings. Then when the Weir stadium opened again in 1968 I started going again, eventually taking our twin sons who are still speedway fans today. We went with the team to Rye House, but despite all the good times we've had there, part of me still thinks fondly of the old Weir stadium." "Thank you so much! A great set of pictures and I am already looking forward to the second instalment! What a great collection this must be and I just wish I could visit, would never convince the speedway hating wife though!" Last year we brought you the 'story so far' of Niall Strudwick's career. Young Niall is a junior rider at Eastbourne and regular in the Southern Track Riders meetings. He's still waiting for his big break into regular league racing but remains determined to make that step as soon as possible. In this article he shares the story of his 2008 season and looks forward to 2009. As always, it's an honest appraisal of his year and gives an insight into just how tough it is to 'make it'. 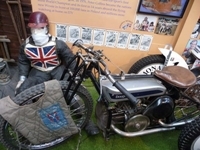 Harry Ward visited the speedway museum at Paradise Wildlife Park last Sunday for the anniversary gathering that celebrates the first meeting in the UK. He took so many pictures that we'll split them into two parts, the second installment will be added to the site next week. Just a single picture this week and it's of the site of the old Rayleigh stadium - The Weir. The picture was taken by Dave Jones shortly after the stadium was demolised. The picture has previously been published in Backtrack magazine. 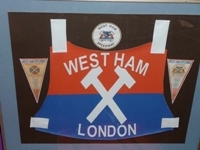 We'd be delighted to hear from anyone who pictures of the stadium in its pomp. The Speedway and Grasstrack Show takes place at The Sports Connexion, Ryton on Dunsmore, Coventry on Sunday February 22nd. Admission will be a bargain £2 for adults with children going free. There are already 35 stall holders confirmed, but there's room for more. Click the banner below for full details of this great day out. "A good dose of common sense in this article, it's obvious to most people that prices are far too high. 25 years ago I would not think twice about taking myself and my 2 kids to Hyde Road, parked in a side street, programme was free with entry. Now it's £17 plus programme at £2, plus £2 for parking - £21 plus about £3 for petrol - total £24. This makes people pick and choose matches that they go to. We need to get real quick or I fear for the future of the sport." We're very fortunate to receive a considerable amount of feedback on the articles and pictures we feature on the site. Here are some of the comments we've received in recent weeks that we've not been yet been able to include on the site. As always, your feedback is valued and appreciated, please keep it coming. Thanks to Howard Williams for these pictures of the Broadford circuit in Victoria. 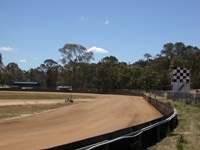 The circuit is notable for having trees on the centre green. 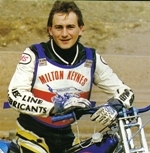 Long Eaton Speedway Reunion Group have organised 'An Evening with Sam Ermolenko' on 10th March at The Bridge Inn, Sandiacre. 'Tapes up' will be 7.30pm and the admission price of £3 includes a raffle ticket. The JustSpeedway.co.uk website, which aims to promote the sport as a whole, now contains a number of new features, including a blog, game reviews and a 'help a rider' scheme. There's a new forum dedicated to speedway in London with all former tracks covered. Click here to pay it a visit.